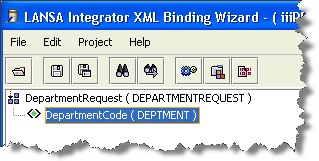 In this step, you will use the XML Binding Wizard to create the inbound request binding iiiPRO06_request.jar. a. Right-click on the Server XML Employees Request folder and select New Solution. d. Type iiiPRO06_request in the Solution File input field. Click OK.
2. The XML Binding Project dialog appears. a. Click on the Browse button. Select the file iiiPRO06_request.xml then click on the Open button. 3. Click the Inbound checkbox. Select the newly-created Inbound tab. a. From the Inbound tab, mark the DepartmentRequest root tag as a Fragment. 5. Build your service by clicking the. Build button on the toolbar. Your JAR file has now been generated and compiled. 6. Save your work and Exit the XML Binding Wizard.